What is a Sustainability Assistant, aka Green Raider? A Green Raider is a student who has an interest in practicing and promoting sustainable living. Sustainability assistants are members of the student body who are interested in things like recycling, energy and water conservation, and environmental issues. Check out this video from Game Day 2016 to learn more! What does a Green Raider do, exactly? Green Raiders do a variety of things, some of which are expected, and some of which are at the discretion of each student’s interests and abilities. A Green Raider’s main purpose will be to educate his or her peers about the importance of living in a sustainable manner. This could take a variety of forms, such as conducting fun, informative residence hall programs, designing and installing educational bulletin boards, or organizing competition between residents on each floor to see who can reduce the amount of waste they generate. Each year, Mount Union participates in several friendly, nation-wide competitions and other local events. 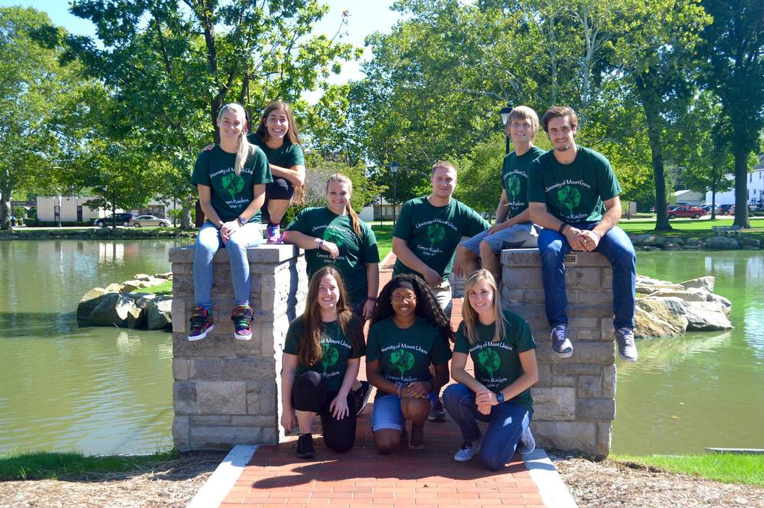 Green Raiders are expected to help with RecycleMania, Game Day Challenge, the Trash to Treasure Sale, and other events. Check out our Facebook page here! We understand students are busy and that school is their first priority. Green Raiders are expected to attend weekly meetings to talk with other Green Raiders, plan activities for the coming weeks, get briefed on upcoming events and the associated responsibilities, and receive education about current topics and events. These meetings typically last one to two hours, depending on the number of events happening at the time. Green Raiders are also expected to attend one afternoon-long retreat at the beginning of each semester. This serves as a time to get to know each other, the sustainability staff, and get organized for the upcoming semester. On top of that, we anticipate the time commitment averaging three to eight hours per week, between educating peers, constructing displays, running programs, etc. Green Raider is a work-study position, with funding available for 10 positions. Volunteers are always welcome! Serving as a Green Raider is a good resume builder, as it will showcase organizational, leadership, and time-management skills, as well as the ability to work independently with little direct supervision, all of which are skills that are important to possess in today’s job market. Plus, students will get to know their hall mates better, have the chance to learn more about things that already interest them, and to make a difference in Mount Union’s impact on the earth and the Alliance community. If you would like more information or an application, please contact sustainability@mountunion.edu. The Mount Union Green Raider Sustainability Awards are presented annually to a faculty member, a staff member, and a student who has enhanced sustainability at Mount Union through actions that promoted the principles of social, financial, and environmental responsibility, and who has done so in a way that created a more sustainable, efficient, and healthy atmosphere for our campus community. What has the nominee done (through education, action, or communication) to promote the sustainability principles of social, financial and/or environmental responsibility on the Mount Union campus? Nominations are accepted throughout the month of March each year. Awardees will be selected by a sub-committee of the Sustainability Management Advisory Committee.